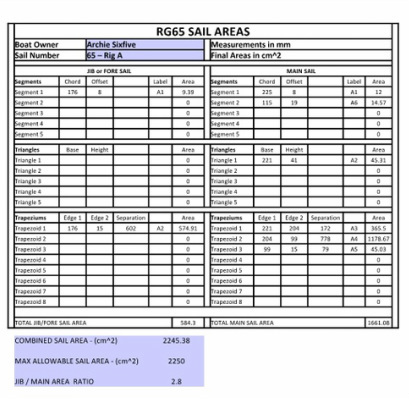 The requirements of the RG65 Rules are that the total sail area should not exceed 2250 cms^2, and the total height from the deck to the extremity of your rig has to remain within 110cm. In addition to this the sail/booms should not extend beyond the length of the hull either to the fore or aft. When designing sails skippers need to be mindful of these constraints. For calculation of the sail area, each sail will be divided into trapezoids and or triangles, whose surfaces must be added or be cut off. Obviously the triangles and trapezoids refer to the sail fabric. Where the sail fabric is rounded with abrupt curves then the continuation of lines, which intersect each other are considered rather than the abrupt curve. If the edge of the sail forms an arc of more than 0.2cm on the side of the trapezoid or triangle, the segment of the resulting arc will be included in the surface calculation. So you need to draw up your sails both jib and main and split them up into triangles or trapezoids. A trapezoid is a closed figure where there are two parallel sides opposite each other. You might like to consider doing a scale drawing on paper first so that calculations can be made and checked before making a full size template. If you have a spreadsheet program such as Microsoft Excel or Open Office Calc you can download this simple Area Calculator provided by Trevor Thomas which will provide the results in the format shown in the example table above. 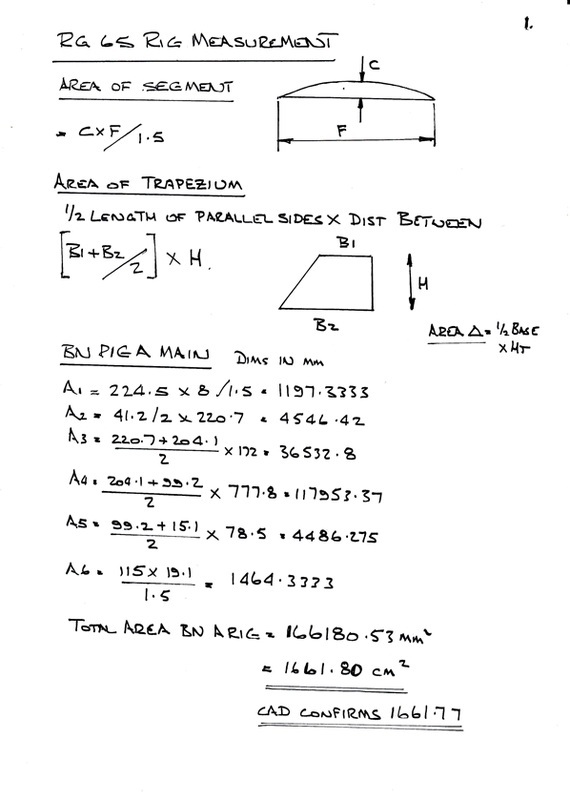 If not there is an example of how to do the calculations long hand at the bottom of this page. 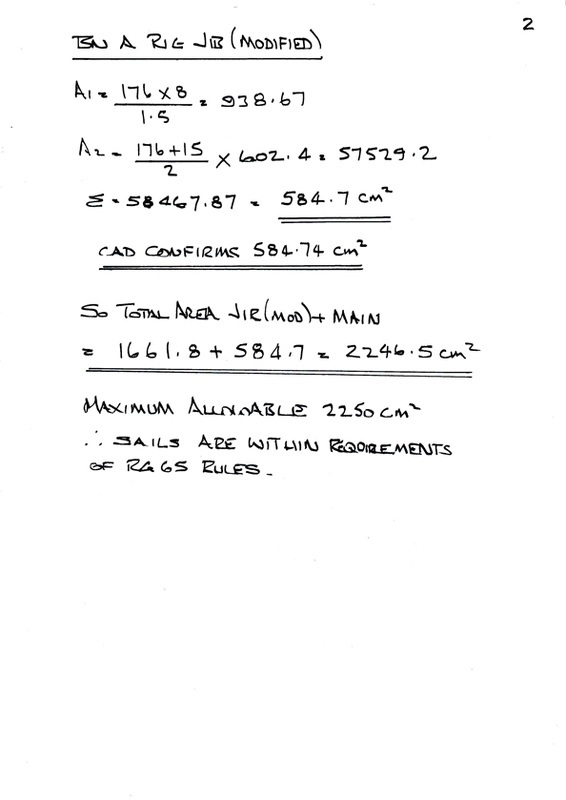 A sample calculation is appended showing the formulas and treatment of the geometry in order to get a maximum sail size for the ‘A’ sail. So on the calculations appended for the main sail it is divided into six areas from A1 to A6. Area A1 is segment calculation, A2 is a triangle, and A3 and A4 are trapezoids, A5 is a trapezoid on its side, and A6 is a segment. For the Jib sail there is a segment A1 and trapezoid A2. It should be noted that the total area of each sail should be recorded on the actual sails, tick marks should be added to the sails to show where the dimensions were taken and these replicated on small A4 drawing showing the areas and dimensions used to calculate those areas (please note under the 2014 rules it is no longer necessary to provide the calculations as appendix 6 has been removed and downgraded to an example sheet). The event measurer will verify and take a spot check of the various dimensions you refer to in the documentation. It is now taken on trust that the areas declared are calculated from the dimensions shown on your A4 drawing. It will be a requirement of our Martin Dale Cup Competition that these documents be to hand so that the scrutineers can objectively measure your sails prior to each event should he so desire. 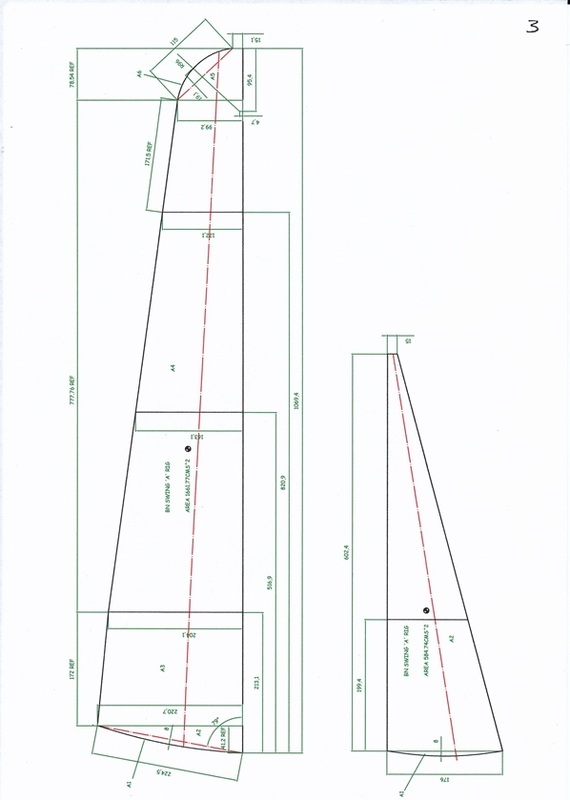 In view of the fact that most skippers would have to carry out the sail calculations in order to produce the surface area's, we request that these are submitted with the sail diagram, preferably in advance, to make the work of the scrutineer somewhat easier and hopefully reduce the time it takes at events to ensure all skippers sails comply with the rules .